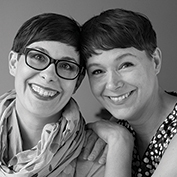 Illustrators Irmela Schautz and Annabelle Von Sperber met when organising the Long Night of Illustration in Berlin, and have been the best of friends ever since. They love spending time in the city’s cultural institutions, exploring the many restaurants and bars in Prenzlauer Berg, and barbecuing in Irmela’s ‘secret’ garden. Our favourite Berlin tip from Irmela Schautz and Annabelle Von Sperber: Visiting Kunstoffe in Pankow to find hundreds of materials no longer needed – perfect for upcycling by artists.